When you have a reputation of being a three team conference: OSU, MSU and maybe Wisconsin — with the rest of the league lagging a couple of paces behind — it is important that the conference performs well in the non-conference. This week some teams held their end of the bargain while others fell flat on their face too lesser competition. The Hoosiers defense still has trouble stopping anyone but at least it forced three turnovers — including a 96 yard interception return by Jameel Cook — in the 36-22 victory over Florida International. Offensively, Jordan Howard led the way with 159 rushing yards and quarterback Nate Sudfeld had three total touchdowns to go with 234 yards passing. You have to wonder if that offensive production will be enough once the level of competition increases. After playing a FCS program in Richmond, the Terrapins stepped up in competition to play MAC foe Bowling Green and that jumped seemed to be too much as Maryland got smacked up at home 48-27. Four turnovers ultimately doomed the Maryland offense that only had 59 total plays compared to 109 for BGSU. Spending that many plays on the field was tough on the Terrapins defense as they surrendered 692 total yards — including 491 passing yards. The one bright spot was another punt return touchdown for Will Likely. Sparty on!!! 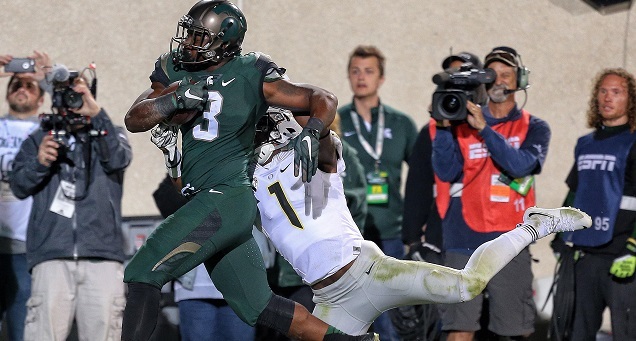 Michigan State’s balance proved to be too much for the Oregon Ducks as both sides of the ball were effective in getting key plays to slow down the Ducks enough to win 31-28. It is only two game into the season, but it looks like they have found capable replacements for departed stars Jeremy Langford and Tony Lippett in running back Madre London (18 carries 103 yards) and receiver Aaron Burbridge (8 catches 101 yards.) It has taken some time for Burbridge to finally come into his own in East Lansing, but for Spartans fans the timing couldn’t be more perfect. It’s still not the Wolverines football that many fans are used to but after allowing Oregon State to drive 79 yards for an opening touchdown, the Michigan defense limited the Beavers to 59 yards the rest of the game and won 35-7. Running back De’Veon Smith admitted he missed open holes last week but atoned by rushing for 126 yards and three touchdowns. The passing game still leave a lot to be desire as Jake Rudock only passed for 180 yards and had two turnovers. There was no letdown as the Buckeyes throttled Hawaii 38-0. Ezekiel Elliott led the charge by rushing for 101 yards and three touchdowns. OSU would have been better off scheduling this game on the road — at least then the players could have seen the sights of the great island. People are questioning the Buckeyes schedule, but for the players they can only control what they can and they did a good job on the day. One potential concern is that in a blow out the back-up running backs only had five carries — 13 if you consider Braxton Miller’s eight rushes. You have to start asking yourself was Christian Hackenberg success his freshman year more about former head coach Bill O’Brien setting him up to succeed or his natural ability, because it seems that since O’Brien left for the NFL the PSU quarterback has struggled. Despite the 27-14 victory over Buffalo, Hackenberg still did not look impressive as he only passed for 128 yards. fortunately freshman back Saquon Barkley picked up the slack by running for 115 yards. At least this time it was the Nittany Lions defense doing the sacking, five, and Hackenberg was able to avoid any, but that offensive line is still shaky at best. Another conference team steps up from the FSC competition and struggles. Three turnovers ultimately doomed the Scarlett Knights as they fell to Washington St. 37-34. Janarion Grant had the play of the game — a 100 yard kickoff return that gave Rutgers the 27-23 lead but the defense couldn’t hold it and surrendered two more touchdowns to WSU quarterback Luke Falk— who finished with 478 yards and four touchdowns– after the big play. Head coach Kurt Flood has a lot to deal with this program and ironically the on-the-field production from his team is the least of his worries as he suspended star receiver Leonte Caroo indefinitely due to an incident outside the stadium after the loss to the Cougars. Second half touchdown passes by CJ Beathard helped the Hawkeyes take the lead in a game that was a lot closer than expected as they defeated in-state rival Iowa St. 31-17. Beathard finished with 215 passing yards and two long runs of 44 and 57 yards, but it was the 124 yards on 24 carries — including the go ahead four yard touchdown run — from back Jordan Canzeri that led the way for the Iowa. This was a rivalry game so I wont hold it against them, but Iowa has to be able to show it can beat the teams they should if they want to contend in the Big 10 West division. Maybe it was a hangover from the TCU defeat or having to get used to the Colorado altitude, but whatever it was took the Gophers a while to get things going in the 23-20 victory. While the offense was sluggish most of the game it was the Minnesota defense that held the team down as it forced four turnovers — including a fumble by defensive tackle Scott Ekpe that set up the winning field goal in overtime — and only allowed 14 first downs despite losing the time of possession battle. No last second heroics this time for the opponent as Nebraska comfortably defeated South Alabama 48-9. Terrell Newby rushed for 198 yards and two touchdowns as the Cornhuskers offense generated 561 total yards. The defense is still a work-in-progress but limiting the Jaguars to only nine points is a step in the right direction. The Wildcats made it look real easy in the 41-0 victory over Eastern Illinois. The offense generated 344 yards rushing — including 77 from Justin Jackson. Freshman quarterback Clayton Thorson continued to impress as he completed 11-of-16 passes for 152 yards. The defense also limited Eastern Illinois to 138 yards and zero third-down conversions in 11 attempts. The Wildcats are now ranked No. 23 in the nation, but must travel to Durham, NC to face the distinguished Duke Blue Devils in another battle of the smart jocks. Normally when it schedule a FCS program, a team expects an easy win and while the Boilermakers defeated Indiana St. 38-14 the game seemed a lot closer when you really broke things down. Purdue only had 5 more first downs and allowed 362 total yards to the Sycamores but it was a quick four play drive and score by Purdue right before the half that swung momentum for good. DJ Knox had another good game as he rushed for 91 yards and Austin Appleby bounced back nicely from the Marshall loss with a 289 yards and four touchdown performance. The best way to get over a disappointing loss is to take it out on the next opponent and that’s what Wisconsin did as they dismantled Miami (OH) 58-0. Dare Ogunbowale stepped in for the injured Cory Clement and ran for 112 yards on 16 carries. It has to be good for head coach Paul Chryst to know that he has a capable back-up in Ogunbowale, and once Clement returns that two-headed monster could pay dividends in conference play. The Badgers defense looked better as it limited the Redhawks to 157 total yards and forced four interceptions — including two by Leo Musso. LJ Scott running back MSU – Madre London carried the ball more on the night, but it was two touchdowns from the true freshman Scott that sealed the victory for the Spartans. With Oregon within three it was his 38 yard touchdown that gave MSU the cushion that it needed to get past the pesky Ducks. Coach Dantonio has the luxury of having two talented young backs who will only get better as the season progresses. This week its a doubleheader as both Illinois and Northwestern travel to North Carolina to face UNC and Duke respectively. Not only are both games opportunities to further validate the progression of the Fighting Illini and Wildcats but it can show the nation that the Big Ten is deeper than many think. While neither Duke nor UNC are expected to contend for the ACC title this year, you cannot pass up a chance to win games against Power-5 Conference schools.